When Should You Open That Bottle? One of the biggest questions with wine is How long to let the wine age? There are some rules of thumb, or maybe they’re more in the realm of urban legend. Such as drinking whites right away, and letting most red wines age for a couple of years, and letting Cabernet Sauvignon age for at least 10 years. What happens when wine ages? From a technical perspective, a bit of oxygen sneaks in through the cork, and then CHEMISTRY happens. From a taste perspective, this can have the effect of softening some of the bolder, fruit flavors that are more typical of a younger wine. In the best cases, when this really works, softening the big fruit flavors allows more subtlety, more complexity to express itself in the wine. In other cases, that complexity is not there to begin with, and and when the fruit flavors soften the wine just tastes a bit flat. And even with the wines that will age, there does come a point when it’s aged too much, and the wine loses its balance between fruit, acid, aroma etc. Also, to be clear, there are a lot of wines, probably the majority of wines made, that are meant to be consumed within the first couple of years after harvest and bottling. Moreover, screw cap closures are helping wines maintain that fresh, fruity, just-bottled taste by not letting any oxygen into the bottle, so chemistry is not happening with those bottles. For those wines that you’re thinking about buying and aging, the advice from the wine industry is to buy a case and drink a bottle every so often – every year, or two years, or whatever seems to make sense – so that you can understand how the wine is aging and make sure to drink as much of the case as possible as near to the peak of the wine as possible. Well, that simply isn’t practical for most of us, including Lori and I. The cost, and the storage capacity, just aren’t reasonable. My first rule of thumb is never buy wine to age from a winery that I’m not familiar with. You could view this as a chicken and egg problem: how to figure out if their wine ages well if you can’t buy a bottle? Typically wineries make a variety of wines, and not all of them are meant to age. If you like the style of the winery/winemaker, go ahead and take a chance on some wine to lay down for a few years. Second, taste the wine you’re interested in investing in. If you don’t like it now, it’s unlikely to taste that much better to you to justify your investment. 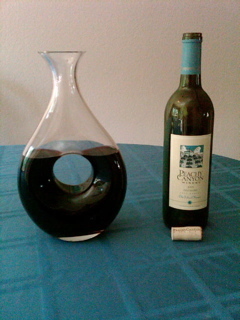 Peachy Canyon 2004 Old School House Zinfandel in the decanter. 2004 Peachy Canyon Zinfandel, Old School House Vineyard, Paso Robles: One thing that happens with older wines is that they can collect sediment; various things coming together and crystallizing in the wine. More oxygen also helps the wine. And decanters make serving the wine more elegant. So decant your older wines. As far as Zinfandel not aging well, it’s a good rule of thumb, as most Zins aren’t built to age well. This one was built that way, and was delicious at the 10 year point. Probably doesn’t have much longer to age. But excellent a few weeks ago. 2004 Soquel Vineyards Zinfandel, Schmierer Vineyard, California: The winery is in the Santa Cruz Mountains, but these grapes are from a vineyard in Lodi, and this vineyard is more than 100 years old. Normally I wouldn’t expect a Lodi Zin to age well – Lodi Zins can be great when young – but in the hands of a really good winemaker, this wine has done just as well as the Peachy Canyon Zin. 2001 Archery Summit Winery Pinot Noir, Archery Summit Estate Cuvée, Oregon: Good Pinot Noir, like good French Burgandy, does age well. This bottle was a bit over the hill; not bad, but not what we hoped for. 2004 Goldeneye Pinot Noir, Anderson Valley: Very nice bottle of wine, with still a lot of fruit flavor up front. Will at least hold on for another few years at this level, and maybe get a bit better. 2010 Armida Winery Sauvignon Blanc, Russian River Valley: Sauvignon Blanc is usually built to drink now. However, some of the best Sauvignon Blanc – French white Bordeaux, or wines from the Loire region – will age nicely. This wine started its life as an excellent Sauvignon Blanc, with big fruit flavors, crisp texture from good acids, great nose. We’ve opened a couple of bottles in the last few months, and it’s even better now. The big fruit has been toned down, the balance of the wine is better, and the real quality of the grapes is coming through. I wouldn’t recommend aging most Sauvignon Blanc, and really this was not done purposefully on our part (too many other Sauv Blancs to drink kept these from being opened), but what a great accident! This entry was posted in wine tasting and tagged aging wine, Archery Summit, Armida Winery, Goldeneye, Peachy Canyon, Soquel Vineyards on October 19, 2014 by vvblogman.